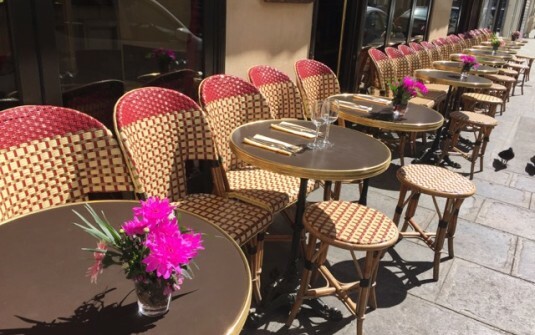 Our restaurant Le Greffulhe is located at 29, rue des Mathurins in the 8th district. Our restaurant offers a continuous service from noon to midnight. Following an artisanal food cooked fresh on site, home fries, tartar chopped one minute, for us it's the restoration. A card carefully designed to sample the finest of wines. Fruity, dry and woody, a wine bar deserves the best advice. A steak, a salad, a glass of wine, our menu is designed so that you do not miss the beginning of the play. Situated not far from the spot where Louis XVI and Marie Antoinette were executed and buried the Mathurins street follows the route of an ancient road open on the grounds of the farm Mathurins. For making the royal family were buried in the field where Louis XVI and Marie Antoinette, cemetery sexton of small-son obtained the privilege to operate a theater. He will become the Theatre des Mathurins and will close in 1908 the Michel Theatre. Opposite these two theaters you will find our brasserie, Le Greffulhe. At the confluence of artists, financial and other lawyers, you will taste in a warm, typical French cuisine, through a menu created by our chef Stéphane. The restaurant takes its name from Henry Greffulhe elected in 1889. It is not uncommon today to come across artists in representation or those just encourage them.